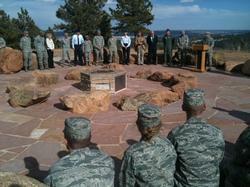 Today a brand-new worship site for Earth-centered spirituality community was dedicated at the Air Force Academy. The site is located on hilltop between Visitor’s Center and Cadet Chapel. The site is open to all faith groups, but priority is given to Earth-centered spiritual groups, such as Wicca, Pagan, etc. It’s part of the AFA’s Religious Respect program to accommodate as many faiths as possible.